Whether you’ve experienced tooth loss due to dental trauma or poor oral health, it’s critical to treat this problem as soon as possible. Dental implants offer patients a stable restoration that looks, feels and functions just as natural teeth do. Fixture: The implant fixture is a screw-shaped piece that acts as the root. This is the piece that integrates with the jawbone to create a stable foundation for the restoration that will later be fitted. Abutment: The abutment is the middle piece that connects the implant fixture with the crown that sits above the gum line. Crown: The crown is the artificial tooth that replaces the missing gap in your smile. This piece is designed to seamlessly blend in with the rest of your teeth. Initial Consultation: At your initial consultation, Dr. Sherman will perform an oral health examination to determine if dental implants are the best option for you. During this examination, she will check to see if you have sufficient jawbone density and gum tissue to support implants. If you’re lacking in these areas, you may need supplemental treatments to improve your candidacy. 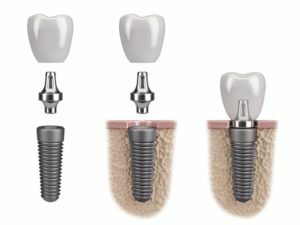 Dental Implant Surgery: Patients without sufficient jawbone density or gum tissue might need supplemental procedures like bone grafting or tissue augmentation prior to surgery. During the implant surgery, the fixture will be placed in the space where the missing tooth was. Healing Process: The post-surgery healing process is critical for successful dental implant treatment. During this time, the implant will fuse with the jawbone in a process known as osseointegration. Osseointegration can take anywhere from a few weeks to a few months, which is all dependent on the individual. Finishing The Restoration: After osseointegration has occurred, there is a stable foundation for the abutment and crown. The crown is designed to match the appearance of the rest of your smile and it is virtually indistinguishable from your natural teeth. Using the Planmecca Intraoral Camera, Dr. Sherman takes thousands of pictures per second to make a 3D model of your teeth. Once your model is complete, she designs your new crown on a laptop, and sends it to the Planmecca Milling Unit to be milled. In about 15 minutes the milling unit creates a beautiful, natural looking crown for your implant. Do you want to enjoy a complete smile again? Dental implants may be the perfect restorative solution to give you back your confident smile. Don’t wait to treat your tooth loss. 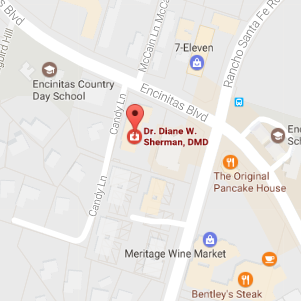 Contact our Encinitas dental office today to schedule your consultation with Dr. Sherman.